By Scott Gilfoid: Former super middleweight champion Carl Froch (33-2, 24 KOs) got a little riled up on Thursday when he was being asked by the boxing media about Andre “SOG” Ward (32-0, 16 KOs). Froch said that Ward’s fighting style is boring, and that HBO, Showtime and Sky Sports don’t want to televise his fights because of his dull style. Froch lost to Ward by a 12 round unanimous decision 6 years ago on May 31, 2011 in the finals of the Super Six tournament. The judges scored the fight 115-113, 118-111 and 115-113. I saw the fight and I had Ward winning by an easy 118-111 score. Froch looked over-matched. Oddly enough, Froch never attempted to avenge the loss to Ward. I can’t say why, but I guess you can draw your own conclusions. “Since the Andre Ward loss, I’ve had an incredible career and made a fortune and come out on a high,” said Froch to IFL TV in talking about his career. “So that loss did me more good than harm. I’m not an Andre Ward fan. I’m not a fan of his style. Do you ever watch an Andre Ward fight? You don’t like the kind of fights that I do then. I like the Arturo Gatti-Mickey Ward type of fights.If you like to watch Andre Ward and those types of fights, then to me you’re not a boxing fan; someone who likes to have a little snooze halfway through the fight,” said Froch. I get the feeling that Froch isn’t quite over his loss to Ward yet. I don’t think Froch has come to terms yet with his loss, as I get the impression that it still bothers him greatly that he was whipped by Ward. I don’t know why it should be a big deal to Froch. It’s not as if it was the first time he was beaten. The talented Andre Dirrell arguably beat Froch in their fight in the Super Six tournament on October 17, 2009. The judges gave Froch the victory by a controversial 12 round split decision. The location of the Froch-Dirrell fight was in Froch’s hometown in Nottingham, UK. Some boxing fans believe that Froch was given a hometown decision over Dirrell. I had Dirrell winning easily by 8 rounds to 3 score with 1 round even. Froch go away with a lot of fouling in that fight. I was surprised he wasn’t penalized and/or disqualified by the referee. At one point in the fight, Froch slammed Dirrell to the canvas in a move that looked straight out of the textbook of a WWE fighter. The referee didn’t take any points away from Froch. Froch was beaten by Mikkel Kessler in the Super Six. Kessler was clearly the better fighter of the two. “I don’t like to fast forward a fight. I fast forward his fights,” said Froch about Ward. ”I know you’re a big Andre Ward [expletive] licker. So, there’s a reason why he’s not lost since he was 12, because of his style, his awkward style,” said Froch. Oh boy, Froch appeared to be having a meltdown at this point in the interview. All the reporters did was say some wonderful things about Ward, and Froch responded by saying that they’re all over the American talent, giving him appreciation. You can’t blame the media and the boxing fans for loving the way Ward fights. He takes apart his opponents by neutralizing what they do best, and then hurting them with body shots. Ward’s body punching is old school stuff. It’s not boring to watch. Ward likes to box initially before he opens with his beautiful shots to the body and head. 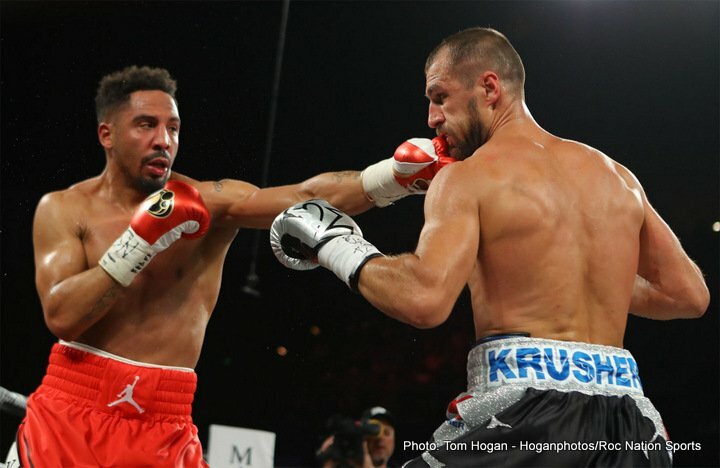 In Ward’s rematch with Sergey Kovalev on June 17, he hurt the Russian fighter with a scorching right hand to the head that staggered him. Ward then followed up with 3 big body shots that had Kovalev bent over looking like he was ready to be dropped. The fight was then stopped at that point. There was nothing boring about that performance. It was Ward at his best, using power shots to the body to wear down and stop a knockout artist. Heck, I would favor Kovalev to beat Froch if the 2 of them were to have fought before the Nottingham fighter retired. ”I’m not going to get into an argument over Andre Ward, because of his boring, horrible style,” said Froch. ”I’ve got broadcasters HBO and Showtime that don’t want to show his fights, and Sky Sports don’t want to show his fights, because he’s boring. People don’t tune in because he doesn’t do numbers. So those are the facts, but you can worm around and do what you want with that. I’m talking about viewers, numbers. People don’t want to watch him, because his style is boring. This is a fact,” said Froch. Ward will wind up on another network soon. I wouldn’t be surprised if it were Showtime. He’s coming off of a pay per view fight against Kovalev on HBO. Fighters like Ward get snatched up quickly. With Floyd Mayweather Jr. retiring after his fight against Conor McGregor this Saturday, the boxing world needs a replacement for him. Ward has got the talent to step into Mayweather’s big shoes and carry the sport. Ward wants to fight IBF/WBA heavyweight champion Anthony Joshua and former cruiserweight champion Tony Bellew. Those would be great fights if they happen. Believe me, Sky Box Office PPV will be televising those fights if they take place. They’re not going to turn down Joshua-Ward or Bellew-Ward. The boxing fans in the UK are going to eagerly purchase those fights and they’ll be happy to do so.